PerfectLaw® is the most function- and feature-rich legal software that uses a single All-in-One® database for all law office applications. This means you enter your data once and it is immediately available to everyone and every application, subject to security constraints. All-in-One® software significantly reduces the cost and effort of installation, training, support, and maintenance. With PerfectLaw®, there is only one vendor to call, and one comprehensive suite of products for your law firm to implement and learn. PerfectLaw® is essentially self-contained so there is no need to purchase software other than Microsoft Office (Outlook, Word, etc.) and associated server software. That's it. This way, you don't need to worry about importing and exporting data or buying other software for integrating with dissimilar packages. 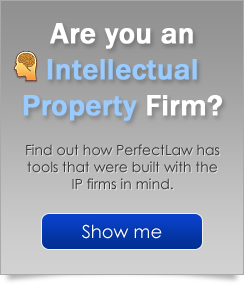 PerfectLaw® runs on the industry standard Microsoft platforms with SQL and Exchange servers. So, you can rest assured that our our legal billing and case management software uses technology that is industry recognized, awarded, and trusted. Our clients return to us because we offer the best product with the latest technology at the best value and service available. But don't take our word for it. Speak to our users about our software and other products and services before making your decision.